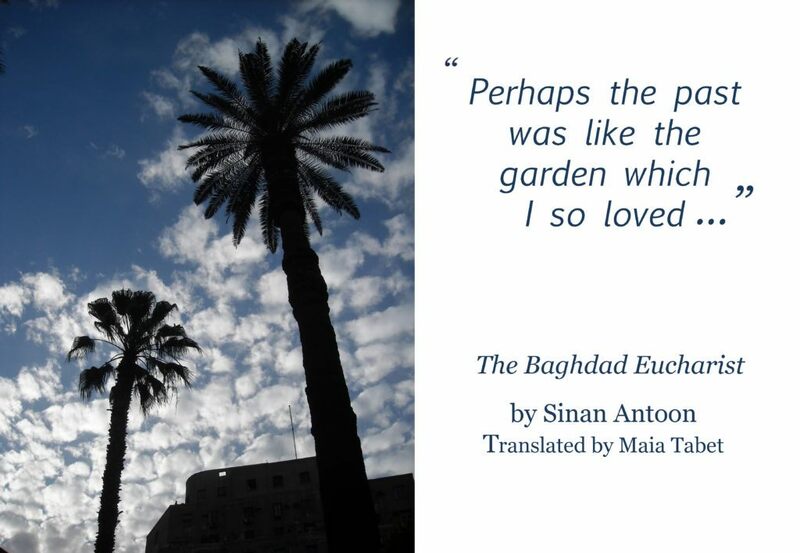 The acclaimed Iraqi poet, novelist, scholar, and literary translator Sinan Antoon was born and raised in Baghdad. In 1991 after the first Gulf War he left to the United States. Today he lives in New York but his heart is still very much in Iraq. 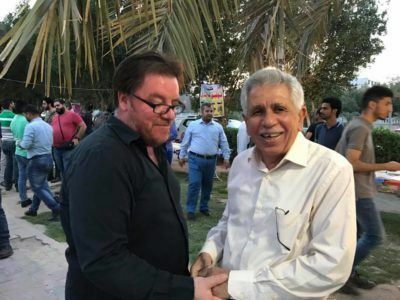 The last time he went ‘home’ was in April of this year for a book-signing in Basra. 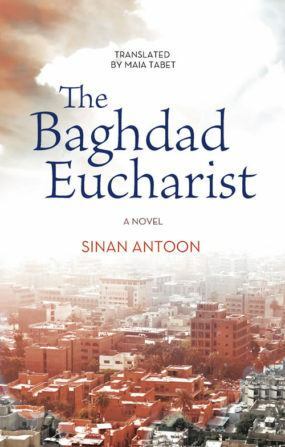 In this recent interview with Hoopoe, Antoon reflects on his Iraqi heritage, the characters in his novel The Baghdad Eucharist, and his writing process. Hoopoe: The Iraqi palm tree is almost presented as a main character in your novel The Baghdad Eucharist, as if standing like a unifying force among the country’s bloody sectarian divide. Was this an intentional metaphor? How important is the palm tree in Iraq’s history and heritage? 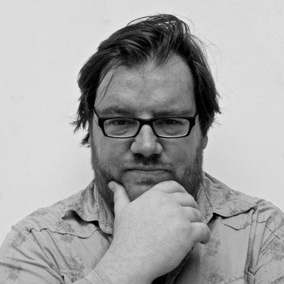 Antoon: It came spontaneously, but I think it was inevitable. I love palm trees and everything about them; from the slender shape to the delicious fruit and there is a dizzying variety in Iraq, close to 400. The palm tree is the quintessential Iraqi tree. It is rare to find an Iraqi house that doesn’t have one in its garden. Before the Iran-Iraq War of 1980-88, there were close to thirty million palm trees in Iraq. So it is an essential feature in the country’s landscape, and of its past and rich heritage as well. The ancient Mesopotamians held it in high regard. It provided nutrition, wine, and its fronds and trunk were and are still used to construct various objects. It is a symbol of fertility and prosperity. No wonder, then that in the Qur’an’s version of the story of Mary she is told to shake the trunk of the palm tree so that ripe dates may fall and nourish her. Being an essential component of Iraq’s landscape, the fate of the palm tree is akin to the fate of Iraqis. The destruction brought about by wars and climate change has killed and uprooted so many. Others are still standing and resisting. Hoopoe: Youssef is one of your main characters. To a large extent, the story is told through his voice. Do you know a Youssef? Antoon: I knew many Youssefs. One of the recurring comments I received from Iraqi readers after publishing The Baghdad Eucharist in the original Arabic was that Youssef reminded them of men in their extended families and neighborhoods. Women and men from an older generation whose identities and world views were not centered around sect and religion. Iraqis who inhabited a social space that was not segregated so rigidly along sectarian lines. The character is a composite of course. But many of his features and biographical details were inspired by a relative of mine. He, too, lived through Iraq’s tumultuous history and died in the late 1990s. He witnessed the rise and promise of a republic and a cosmopolitan city and lived long enough to see its disintegration, particularly, after the 1991 Gulf War and the genocidal embargo (1990-2003). Hoopoe: Youssef, the middle-aged, nostalgic yet optimistic Iraqi, and Maha, his young, disillusioned niece, could not be more different. Are these two main characters how you perceive Iraqi society today–the older generation still imbued with some peaceful memories of coexistence, picking dates or sharing coffees, oblivious of religious affiliation, and the new generation torn and born into war, sanctions, and post-traumatic stress? Antoon: This is not the only division, but it’s an important one to be sure. In the novel the divide is generational. It is not uncommon for a society that has witnessed and weathered several destructive wars, including a sectarian civil war with devastating effects on all levels, to suffer major fissures and divisions. I have been interested for quite some time in the concept of collateral damage. In addition to the material damage brought about by dictatorship, wars, and military occupation, there is considerable damage and destruction of Iraqi collective memory and of the idea of Iraq and Iraqiness. The idea is not to be uncritical and nostalgic, but to reimagine and remember a different Iraq and a sense of Iraqiness that did exist. Juxtaposing Maha and Youssef serves to keep the questions open. The dismantling of the Iraqi state and its institutions and totalitarian ideology was followed by establishing an ethno-sectarian system whose culture and practices were institutionalized and popularized through post-occupation media. Sectarian identities and histories were internalized as were notions about the inevitability of sectarian strife. Hoopoe: Hinna, Youssef’s sister is an interesting character. Where would such a conservative, pious Christian woman fit into today’s Baghdad? Antoon: There aren’t that many Hinnas left in Baghdad. Most of them left the country. That is the sad reality. Hoopoe: A couple of years ago, in an interview with The Guardian you said: “Sometimes unintentionally, what I imagine the character would go through ends up happening in real life in Iraq.” Conversely however, have you not fictionalized real events and woven them into your story? Antoon: Yes, of course. It’s a two-way street. Some of what Maha says at the end of the novel is taken from actual testimonies by two women who survived the bombing. I did that as well in the previous novel, The Corpse Washer, where I fictionalized events from the sectarian civil war as well as narratives and details from and about the situations faced by corpse washers. But the comment in The Guardian article was written after what befell Mosul. In The Baghdad Eucharist, Maha was afraid that there would come a day when Christian Iraqis would be forced to leave their homes in droves and their presence would be limited to museums. After ISIS occupied Mosul in 2014 they forced all Christians, amongst others, to leave the city and confiscated their houses. What the character feared in the novel became a reality. Hoopoe: How do you write your novels? Do you carry around a notebook to keep track of your ideas or jot down sentences, do you rewrite a lot but then go back to old drafts, and do you ever feel you are not telling the story you really wanted to tell? Antoon: I think about them for a long time beforehand. I am haunted by a character or a scene and I let it work its way for a while. I do jot down some ideas, mostly sentences and reminders. I do have a notebook for those purposes and the occasional poems I write. But when the actual writing begins I write very slowly and edit the sections that I wrote the day before several times. Some of the most fascinating sections or lines are ones that were unplanned. They come out of that mysterious space. That well that I can’t get to or return to that easily, but when I am there I am rewarded. Stories do take unexpected turns, but by the end I feel it is the story I wanted to tell. Hoopoe: What is it about writing that you like and dislike? Antoon: I think Virginia Woolf said once “it’s good to have written.” Writing is a very difficult process for me. It is taxing emotionally and even physically at times. When I was a teenager I read a sentence by the Egyptian writer Yusif Idris about “writing being the most difficult profession.” I dismissed it as hyperbole back then. I often remember his words when I write. I’ve dispensed with the negative. What I like is the pleasure of creating and recreating entire worlds and lives. How characters and events become real even to their author. What I relish is seeing how the seed becomes a tree. Hoopoe: One of the courses you teach at NYU is ‘The Modern Arabic Novel.’ Must it inherently contain residues of the colonialist, tradition versus modernity, “East” versus “West” paradigms? How can today’s contemporary Arabic fiction in translation connect with the audiences outside the Arab world? Hoopoe: What adjectives would you use to describe Iraq today and how do you foresee the coming years? Antoon: Iraq is often associated with the beginnings of human civilization, and rightly so: the first city-states, the invention of writing, and our foundational myths (Gilgamesh) come from Iraq. 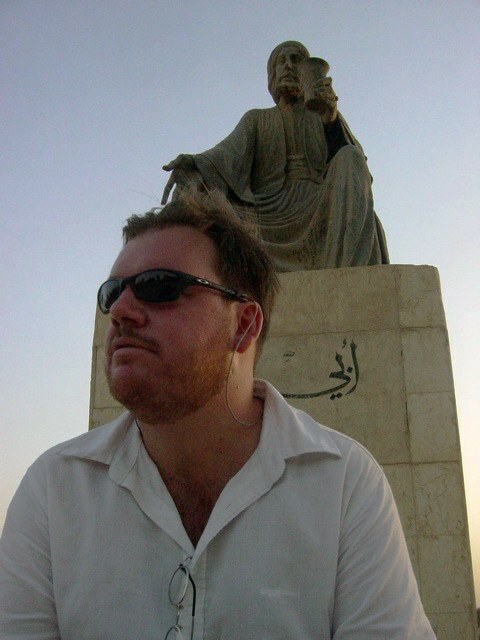 In the past few years I cannot help but think that Iraq, alas, will be associated with endings. Millions of Iraqis are displaced and in refugee camps. Mosul is destroyed. Iraq’s two rivers, once a symbol and a source of prosperity, are polluted. There are four and a half million orphans and a million widows. The effects of permanent imperial and proxy regional wars, of terrorism, of environmental degradation (the depleted uranium used in 1991 and 2003) are everywhere. So, the catastrophes our species will face in this century are all magnified and crystallized in Iraq. But there is a new generation of young Iraqi men and women who want to live and they are resisting. But the forces arrayed against them are brutal.